1932 Cafe & Restaurant is located in the arcade of one of Melbourne’s most loved architectural icons – the Manchester Unity Building. The cafe is an art deco inspired breakfast and lunch destination and the restaurant’s 1930 era decor showcases the history of the building itself. 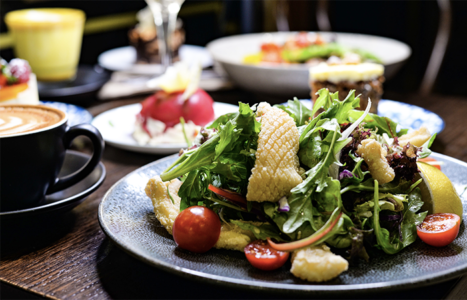 Fully licensed and open 6 days a week, 1932 Cafe & Restaurant offers a seasonal breakfast and lunch menu along with sumptuous cakes and coffee in keeping with the Melbourne cafe scene. Our specials are updated weekly. In 2015 the Manchester Unity Building teamed up with 1932 Cafe & Restaurant to offer an exclusive “Meal & Tour” experience. Currently running once a month on a Sunday, you can choose from breakfast, lunch or afternoon tea sessions.